It’s here… the highly anticipated 2016 line-up for the Falls Festival. Once again organisers have outdone themselves, revealing a mammoth list of local and international talent who are set to entertain audiences in Lorne, Byron Bay, Marion Bay and, for the first time in 2016, Fremantle. Childish Gambino heads the list of top notch talent for 2016, but will be performing exclusively at the Falls Festivals. The same goes for London Grammar, who’ll be making their only Australian appearances at the festivals. With their long-awaited second album ‘Wildflower’ still lingering on the tastebuds of the nation, The Avalanches will be back on the stage, along with Violent Soho, Matt Corby, Alison Wonderland, Catfish & The Bottlemen, Fat Freddy’s Drop, Ta-Ku, The Rubens, The Jezabels, Ball Park Music, Grouplove, Bernard Fanning, Jamie T, Broods, Tkay Maidza, Illy, Grandmaster Flash, MØ, Hot Dub Time Machine, DMAs, AlunaGeorge, Client Liaison, LDRU and many, many more. 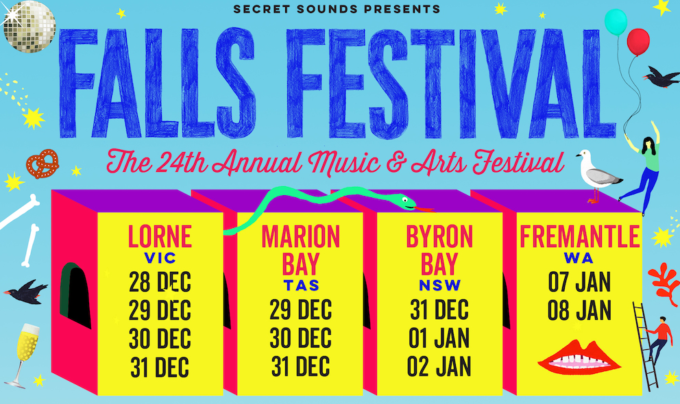 Sadly for Fremantle fans, a number of the acts (including Alison Wonderland, Catfish & The Bottlemen, Fat Freddy’s Drop, The Rubens and Bernard Fanning) won’t be making the trek westwards. General tickets are on sale from 9am next Tuesday, August 30, from the festival website, with tickets to the Marion Bay edition on sale from retail outlets at the same time.